Overlake’s builders, Evans Coghill Homes and Shea Homes, offer beautiful designs with lasting high-quality features including spacious kitchens and tasteful master suites. Well-appointed single-family homes are just the beginning of Overlake’s appeal. 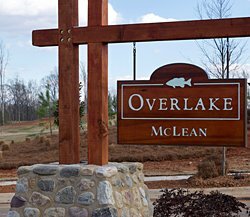 The neighborhood provides plenty of space for adults and children to play, including community pavilion and playground, nearby by mountain-bike area and walking paths linking Overlake to McLean’s more than 100 acres of community woods, parks and waterfront. Overlake is open to visitors. Evans Coghill expects to open its model home to visitors in April. Shea Homes plans a June opening for its model home. Both builders have sales offices open now. Visit Evans Coghill Homes and Shea Homes online to see home designs and arrange visits.